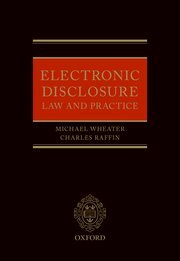 Since the publication of Electronic Disclosure Law and Practice by Michael Wheater and Charles Raffin of Hardwicke (I reviewed it here), Hardwicke has been delivering a series of seminars on various aspects of using electronic documents in disputes. The sixth seminar in this series takes place on 19 June and is about electronic document production in international arbitration. Common approaches to document production in international arbitration – including the IBA Rules and institutional guidance. Dealing with the preservation, review and production of electronic documents in international arbitration. The seminar is free. You can register your interest by emailing events@Hardwicke.co.uk. This entry was posted in Discovery, eDisclosure, eDiscovery, Electronic disclosure and tagged Charles Raffin, Michael Wheater. Bookmark the permalink.